I’d like to think that I’m organized. I’m organized enough to know the general area where something can be found, but that’s about it. I’m also a bit of a pack rat. My darling husband calls me a yarn hoarder. I have been bad in the past for saving everything. I mean everything. I just threw out notebooks from high school, thinking I might “need them”. The university ones are next. When in doubt, I google, I don’t go back and look through my boxes of notes. Granted, it did have a huge “POWER FIST” label on it which I couldn’t quite peel off, but who cares? The top compartment is great for holding all of my pliers (which I had bought at Michael’s for a ridiculous price, and DH bought me some at Home Hardware for half the price… for FIVE! ), some wire, and the longer head pins that don’t fit in the smaller compartments. Speaking of compartments… there are 4 cases, each with 18 smaller compartments. You can take some of the walls out and make them larger, should you wish. It’s awesome. The best part is that it was only $11.99. They had a comparable case at Michael’s for about $50, on sale (granted, it was slightly larger… but $50, come on!). So I guess in this post, dear readers, I encourage you to look outside of the box for your storage/organizational needs. Craft stores will put a label on something saying it is for ‘jewellery storage’ or ‘scrapbook storage’, and charge more, because it is specialized. Check out the hardware stores, or dollar stores. I’ve been finding lots of awesome findings for less than a quarter of the price at dollar stores lately. 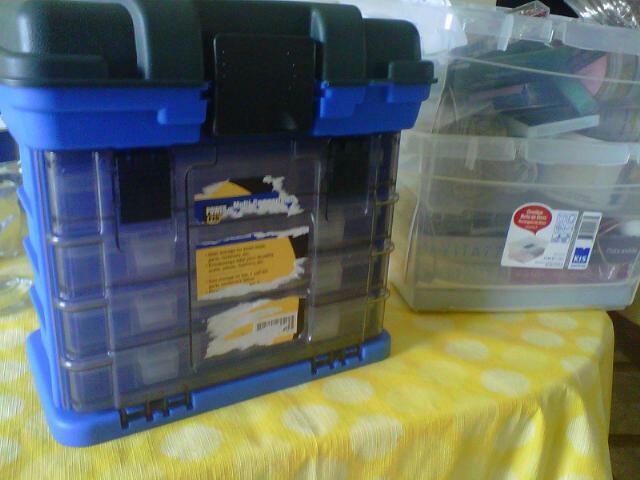 Oh… and the two plastic crazy bins you see beside my new tool box are the bins that I have been using for my beads. It’s really just a jumble. I will be saving one for my larger things, like my loom, and bead board, and books. Even to get rid of a grocery bag of packaging was nice. And kind of sad. We don’t have a bulk bead store locally, so when you buy beads, there is a lot of packaging.